The Martin Liberty II Design Table features contemporary square-tubed styling in an all steel base with a durable, baked enamel finish. The generously sized top which measures 30" x 42" is covered in a simulated light birch melamine which compliments beautifully with any decor in the home or office. 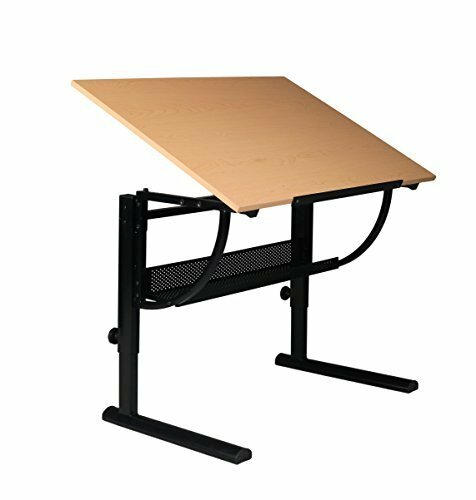 This table adjusts in height from an ultra-low 23" to 33.5" in the flat position making it perfect for multiple applications such as drawing and design work to sewing and crafts. In addition, the top tilts from 0 - 70 Degree and includes a pencil ledge/sheet stop to keep papers and drawing instruments in place even when top is positioned at an angle. Generously sized light birch melamine top measures 30" x 42"